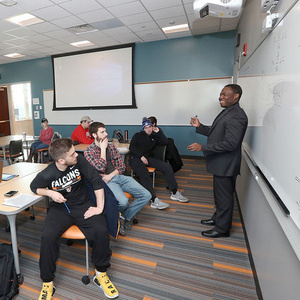 BGSU’s Active Learning Classrooms (ALC) are specially designed spaces that bring together pedagogy, design elements, and technology to help faculty fully engage students in the pursuit of learning. In order to help faculty make the best use of these classrooms, the CFE is pleased to present an ALC Certificate. By earning the ALC Certificate, faculty members earn the right to have priority in reserving one of the active learning classrooms over those who have not done so once they complete this two-part training. Please note that earning an ALC Certificate does not guarantee that an ALC classroom will be made available. Part 2 will demonstrate the ALC technology in the classroom as well as include discussions on how to meaningfully integrate the technologies and strategies. Please note that ALC Strategies Part 1 is a prerequisite to ALC Technologies Part 2.